Stroke Recovery Time - Diet, Therapies and Exercises! In general, full stroke recovery can take as little as a couple of week to as long as many years. The amount of time that it takes for a patient to recover depends on much time it took before medical care was rendered as well as the extent of brain damage that occurred. In addition, post stroke symptoms do not always manifest immediately, so there is a chance that you could experience what is known as false recovery. 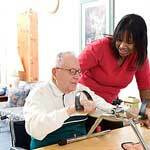 Speech therapy for stroke victims will only be necessary if your speech becomes impaired. Your speech may be completely restored as soon as the paralysis wears off, but others experience permanent nerve damage that cannot be reversed. Even still, there are other things that you can do to help speed up your stroke recovery. If you smoke cigarettes, drink a great amount of alcohol, live a sedentary lifestyle, eat poorly or are overweight, you will need to make some very important lifestyle choices. Some people are only have to eliminate a few major risk factors from their lives, so make sure that you choose the most important ones. For instance, if you are a heavy smoker but you are also a few pounds overweight, you should focus on stopping smoking first rather than trying to rid yourself of a couple of vanity pounds. In addition to completely changing your lifestyle, you may also want to look into surgical techniques for removing plaque from arteries. These procedures are quite invasive, but they can also drastically lower your risk of future strokes. Ultimately, stroke recovery always takes an indeterminable amount of time. Consider yourself very lucky if you do not need to be hospitalized for an extended period of time and require no long-term physical therapy.